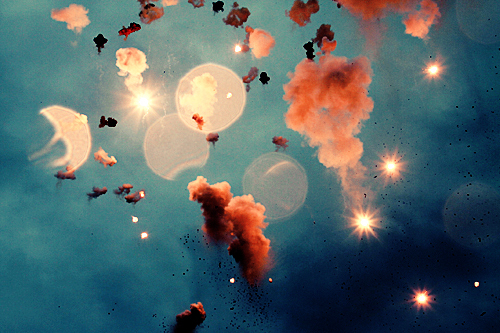 Well, I bet you’ve already guessed one of the festivals on our list! Sorry, Assumption Day, it’s not you. Here are the five festivals we loved the most during our time in this party-loving city! Fallas is the Valencian festival, for an entire week turning the city into a exploding, singing, marching, crying, drinking madhouse. We love it. 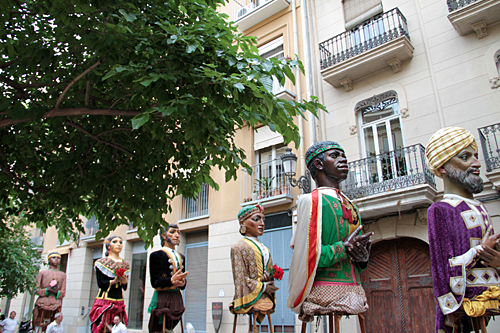 If you visit Valencia during Fallas, you will never, ever forget it. Not really a traditional festival in the sense of the others on this list, but a great time regardless. The annual wine festival in the Turia seems to grow in popularity every year and, why not? With an incredible selection of cheeses, sausages and wines, and a great atmosphere which seems to buzz with the joy of spring, this is an event which no one should skip. Unless you’re one of those teetotaling losers. 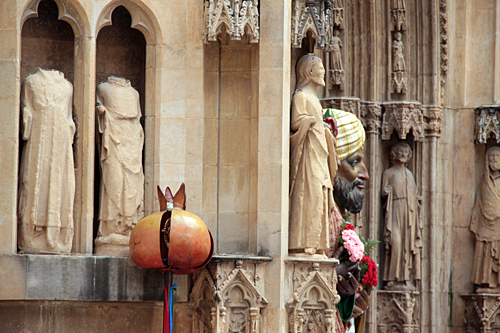 Possibly even crazier than Fallas is the celebration of Our Lady of the Forsaken — Valencia’s patron saint. The Sunday morning parade is the shortest, most intense religious freak-out I’ve ever seen. 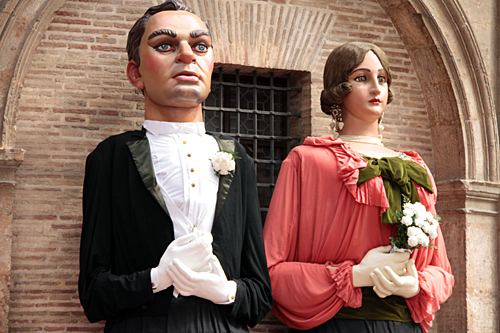 In May, Valencia’s second most important festival gets underway, with bizarre parades, towering dancing figures and la moma — the lady dressed in white. It’s all tied to religion, of course, but what a giant-headed dancing Moor has to do with the body of Christ is anyone’s guess. Get out your Valencian flags and head down to the Ayuntamiento, where the city will be celebrating itself in a grand fashion. This is the most nationalistic of Valencia’s holidays, and there’s often trouble as black-clad (and perhaps slightly fascist) Spanish nationalists come up against Valencian separatists. A good time! This must be the kind of discovery that anyone who gets into the field of restoration hopes to one day make. A dusty, dirty old painting in storage at the Church of San Andrés was cleaned up and restored by The Light of the Images, the same group responsible for the marvelous renovations of the Glory of the Baroque. Underneath the grime and neglect, workers realized that they were holding a painting by the 16th century Valencian master Francisco Ribalta. 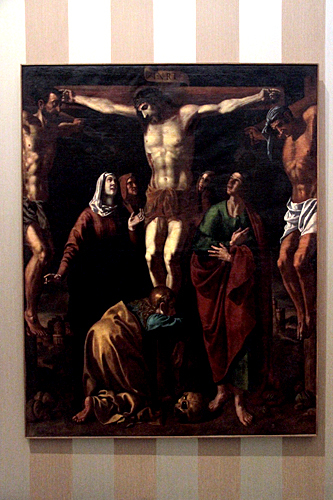 A crucifix scene now christened “El Calavario”, the painting depicts Christ on the cross with a kneeling Mary Magdalene, the Virgin Mary and a few others surrounding him. The painting has been dated to 1620, eight years before the artist’s death, when he was already respected and firmly entrenched in Valencia. Ribalta was of the Baroque era, and one of the first Spanish practitioners of Carvaggio’s tenebrist style. You can see his newly discovered painting in the church of San Juan de la Cruz, as a part of the Glory of the Baroque exhibition. Crazy weather tried, but wasn’t able to totally dampen the Corpus Christi festivities this year, and we made sure to show up for at the Palacio Arzobispal for the Paseo de las Rocas. Close your eyes, and imagine a magical land called Pony Paradise, where diminutive horses are fed sugared hay on cotton candy sticks, and get deep horse-muscle massages from enslaved jockey midgets. Now open your eyes again, because the Paseo de las Rocas is the exact opposite of Pony Paradise. It is HORSEY HELL. 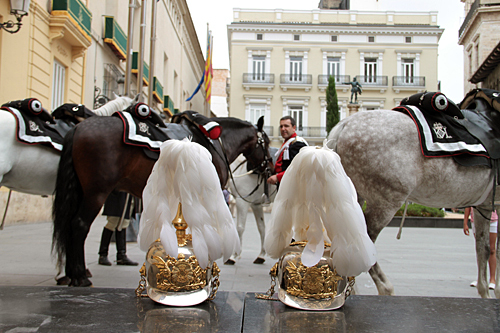 At the Palacio Arzobispal, the smallest horses are selected to drag the mammoth Rocas up the hill. 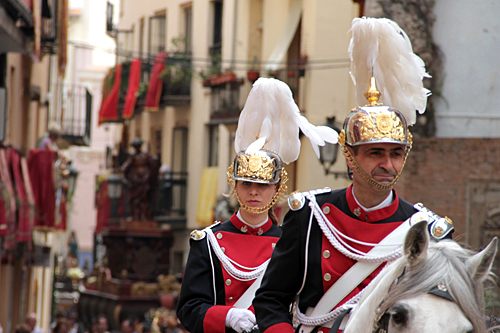 Fat, sadistic Valencians “encourage” them with vicious stick beatings, laughing as the ponies bray and buckle under the weight, sometimes collapsing onto their knees. Naturally, it’s one of my favorite events! I always make sure to show up early, to jeer at the stupid ponies and take pictures of their hilarious suffering. Hey now don’t look at me that way, my family was slaughtered by a wild band of crazy horses. They are my enemies. all day – The Rocas, centuries-old wooden structures which illuminate the “mysteries” of the Catholic faith will be on display all day. 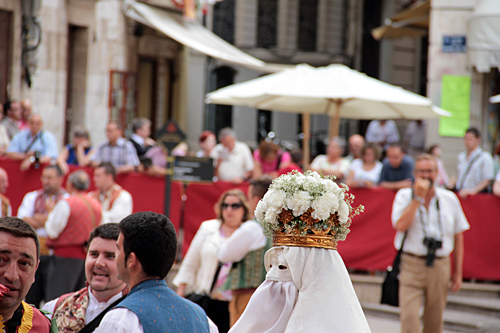 19:00 – Performance of “The Mysteries” in the Plaza de la Virgen. If memory serves, it’s mainly for and by children. 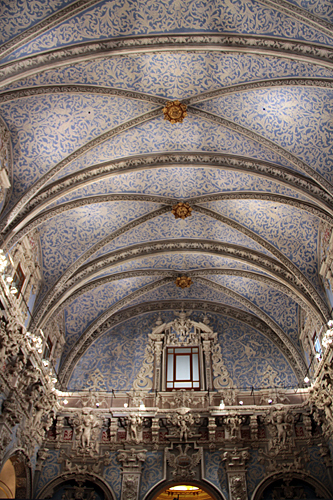 23:00 – Concert by the Valencian Municipal Band in the Plaza de la Virgen. They’re always worth catching, especially if it’s a pleasant summer evening. 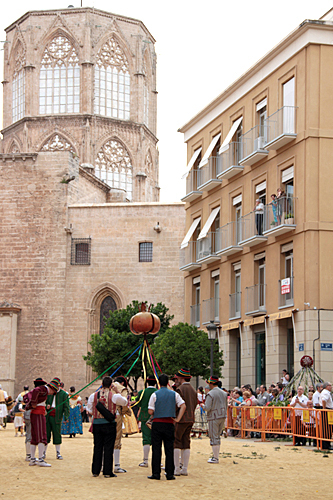 00:00 – Festive parade during which the best-decorated balconies are awarded prizes. 9:00 – Bell concert from the Miguelete, the bell tower of the city cathedral. You say “concert”, I say “maddening cacophony”. 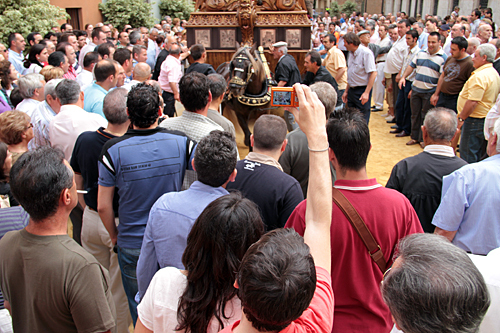 12:00 – Cabalgata del Convite. Really, if you see just one parade this year in Valencia, make it this one. With crazy costumes, including La Moma, fun dancing and lively music, this is the most fun parade I’ve ever seen. Stand along Calle Avellanas, to see Herod’s henchmen get drenched with water from the balconies… just don’t stand too close if you want to stay dry. 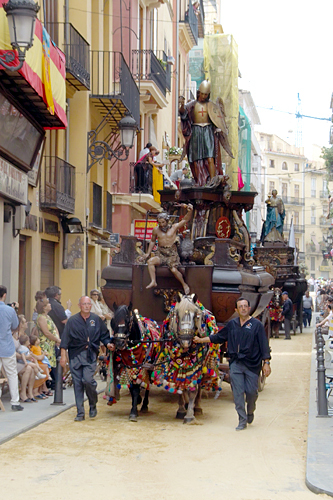 16:30 – The 2nd of the day’s parades is the Paseo de las Rocas, when tiny horses carry the enormous Rocas through the city streets. 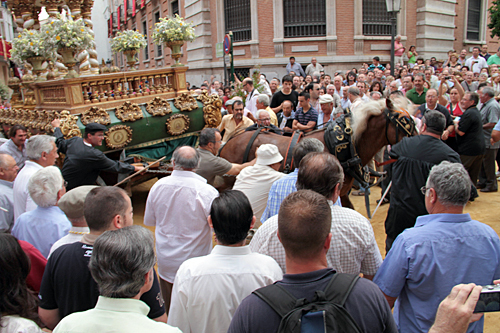 As the parade comes around the Palacio Arzobispal, bets are made on whether the smallest horse in each convoy can drag its Roca up the slight hill. It’s exciting and cruel. 17:30 – Dance of the giants in the Pl. Virgen. Huge figures and groups of costumed people dance around the plaza. Last year, we met two wild-eyed Catholic German girls here, who tried to convert us to their faith. 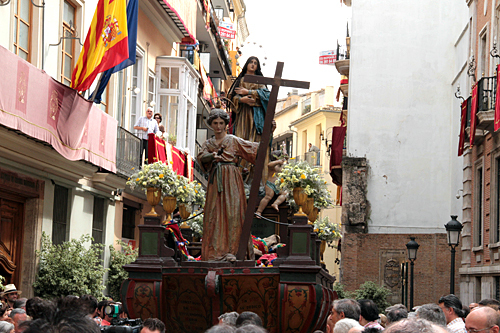 19:00 – Solemn Procession of the Corpus. Alright kids, the fun is over, and this dreary parade lives up to its name. Women in black and men in suits walk solemnly down the street, on their way to the cathedral. It’s a lot; a lot of parades, music, dancing, events. I’m exhausted just typing it out. The best thing to do is probably just plan to spend your weekend around the Plaza de la Virgen, which is where most of the action takes place.